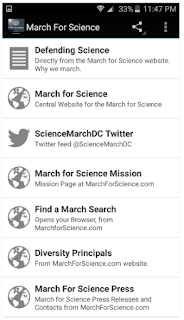 March For Science, the App guide. For Android devices, in the Google Play store now. Free App, NO ads, by Dr. Ken Mitton, a Vision Scientist from Michigan. There are marches for science on April 22nd 2017 all around the United States, Canada, Germany, France, UK, Australia and more countries around the world. Find a march near you on the March for Science website and show your support for the idea of making good policy based on science, not political ideology. Of course this march was inspired by recent marches on Washington DC, resulting from rather scary policies being put forward by the current White House. President Trump and his cabinet. The Trump administration has appointed secretaries and administrators that will retract environmental protection laws, FDA rules for controlling the substances and chemicals that companies can sell to Americans as safe "medicines", and very recently will defund the Great Lakes protection program. Leaders have been appointed that do not understand science, what science provides to both our well being and the economy, and who even ignore the scientific evidence for human-driven climate change. US government scientist are being gagged from telling the press or public what they have discovered when it may not be convenient to the political desires of the White House. 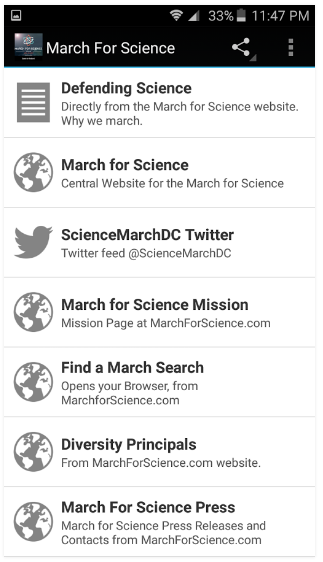 This App makes it easy to follow and keep in touch with the March for Science website and their main twitter feed and facebook page. The App is very tiny, less than 2 MB. This App is not just free, it is also free from Ads! It is my donation to the March for Science cause. As a scientist, eye researcher, biochemist, university professor at Oakland University in Auburn Hills and Rochester Michigan, I invite you and your family to March on Earth Day to show that you think your leaders should make policy based on evidence and not just on their politics.